The forces driving today’s world of structural change create sharp bends in the road that can lead to major explosions in your existing market space. But exponential change also offers exponential opportunities. How do you leverage change to go on the offense? 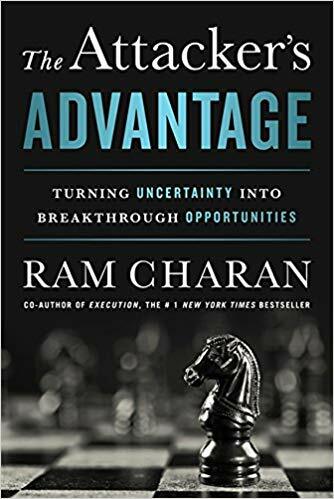 The Attacker’s Advantage is the game plan for winning in an era of ambiguity, volatility, and complexity, when every leader and every business is being challenged in new and unexpected ways. Build the perceptual acuity to see around corners and detect, ahead of others, those forces, especially people, who are the catalysts of change, that could radically reshape a company or industry. Have the mindset to see opportunity in uncertainty. Commit to a new path forward despite the unknowns, positioning your business to make the next move ahead of competitors. Break the blockages that can hold your company back. Know when to accelerate and when to shift the short-term and long-term balance. Make your organisation agile and steerable by aligning people, priorities, decision-making power, budgeting and capital allocation, and key performance indicators to the new realities of the marketplace.